We've been busy around the new Casa Fanatic!!! No major transformations yet, but they're coming. Last week 99% of the delivered boxes had been unpacked, shelves added to storage closets and it was time to start making things pretty. I LOVE organizing, but it's a lot more fun when the house is decorated. Plus decorating makes a house feel like home. I can honestly say things were a little more cheerful once the artwork was put on the walls. 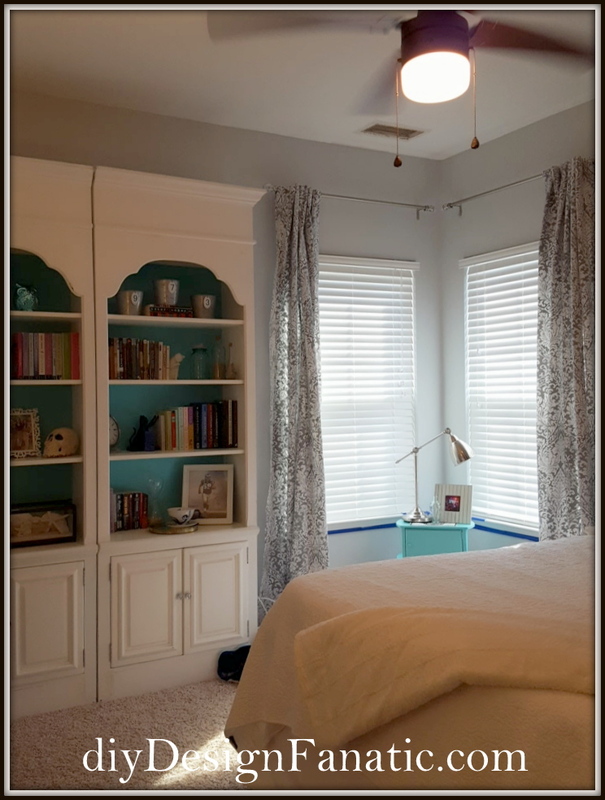 There also wasn't a single curtain rod in the place - just plain white blinds against boring plain walls. The framed chalkboard had come apart in the move, so Mr. DIY put it back together and then put it up on the Foyer dresser. The Dining Room was the first room to be unpacked and somewhat put together. We still need to put up some curtain rods and draperies. We brought the custom draperies I made for the last house, but they were made for one big window, so I have to divide them into two. I'm searching for a new chandelier and possibly a server and as I'm looking at these photos, I'm thinking that this artwork might look better in the breakfast area. Mr. DIY purchased some Ikea Hemnes bookcases for our office and I filled them up fast. They were larger than our previous bookcases (taller ceiling than the last office) and gave us 2 extra shelves. The extra space was used to hold books that had been stored in the armoires that were in the Family Room at the last house. We're using the armoires in the office in this house, so there isn't any storage in the Family Room until Mr. DIY has time to build a custom entertainment center. The lower shelf is one of my favorites as it holds some of our girls artwork they made in school. it's already been painted a new color. She still has artwork to hang and we'll be trading out her wire closet for a semi-custom one in another month or so. You saw this photo last time, but I had to include it. The curtains are too short so we have to purchase new ones at Ikea, but until then, these dress up the place, along with my grandmother's antique mirror. 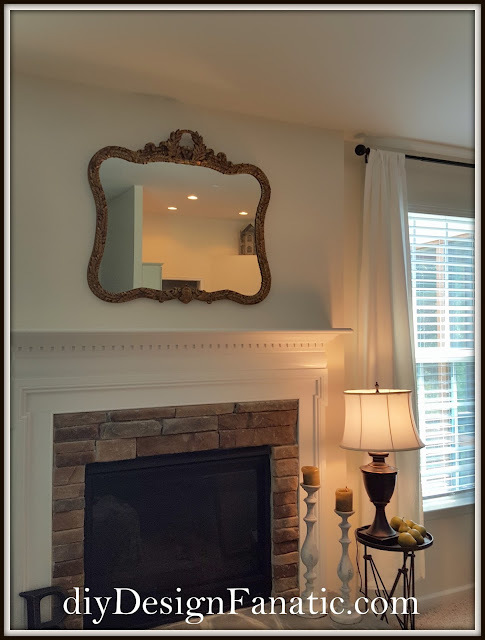 This mirror hung over my parent's fireplace and now it's displayed prominently over our Family Room fireplace. There's still so much that has to be done so we do a little bit every day. Next big project: Mr. DIY will be working on installing a wall of garage cabinets first so we can have the last trailer/pod of storage, garage items and miscellaneous furniture delivered. Can't wait for that! I miss our porch furniture and a couple of chairs that were put in that last trailer. Hope you're enjoying these last days of summer. I'm looking forward to cooler days and night. Everything is looking so great! You've gotten a lot done. The garage storage will help make the leap to getting your move finished. Someday you'll have to tell me what Tim does and how he's so talented! What a lot you have accomplished and so much fun! It's really nice Pam. Keep showing us your updates!! Thanks Libby! There's still a lot to do and we keep plugging away. It's nice to have made so much progress, though. I know you must be thrilled to be making progress. Living out of boxes is no fun. I truly do not understand how people are able to get their homes looking that well put together. Even if I had a blank slate to work with, whatever organization solution I try just seems to look a bit like a rat's nest. You look very well put together considering what a short time you've been in the house so far! I am particularly liking the storage cupboards that you've picked out. Very nice complement to the entryway!